Sprained ankles are one of the most common sports-related injuries obtained by people. Although a sprained ankle may not be a major injury, it could be quite a hindrance to daily activities and of course, sports or other physical activities would not be possible without further injuring the ankle. Depending on the severity of the sprain, there are plenty of sprained ankle treatments in Singapore that can provide recovery from 6 weeks to up to 4 months. However, with adequate rest, proper treatment and rehabilitation, the healing process could be sped up significantly. Sprained ankles typically occur when the ankle is turned at an unnatural angle and the ligaments connecting the bone and ankle tears. Typically, an ankle sprain can be identified by the pain, swelling, stiffness and instability. A minor sprain involves a stretched ligament with slight tearing. The pain would not be too intense and it would still be possible to walk with a limp. If the ligament is completely torn, the ankle joint would lose its function and stability. Intense pain would be felt initially but it would wear off after a while till no pain is felt and swelling would be extensive. You can identify a sprained ankle by bruising around the affected area, a swollen or painful lump near the ankle, and a general instability of the area. Depending on the severity of the sprain, a doctor may recommend several treatment programmes to suit your needs. Most of the time, sprains will go away with adequate rest without further pressure on the feet, but extreme cases may call for surgical solutions like arthroscopy. As with many other kinds of leg and joint injuries, the R.I.C.E (Rest, Ice, Compression, Elevation) method is the first form of treatment to contain the injury and reduce pain and swelling. Rest: Avoid weight bearing as much as possible to allow the ankle to heal and prevent further aggravation of the injury. Ice: Using an ice pack or ice wrap, apply it on the injured area for 10-15 minutes several times a day. This would reduce the pain and swelling. Compression: After icing, use bandage to wrap around the injured area snugly. Make sure that it is not too tight that it cuts off blood circulation. Elevation: Raise your leg above the heart level to further reduce the swelling. These four steps should be repeated at least three times a day or until the pain and swelling subside. During this time, you should also restrict movement and involvement in physical activities. If you have difficulty walking, consider a crutch or an ankle brace to assist you in your daily routine. Generally, no medication is required for a sprained ankle, but painkillers are sometime given out if necessary. Nonsteroidal anti-inflammatory drugs (NSAID) can help to reduce the inflammation and reduce pain and swelling. Other than that, over-the-counter painkillers are also prescribed to handle the pain. These can include ibuprofen (Advil, Motrin IB, others) or naproxen sodium (Aleve, others) or acetaminophen (Tylenol, others). Keeping your ankle immobilized for too long can result in stiffness. Always wriggle your toes or move your ankle lightly whenever possible to keep it flexible. Once the injury has stabilized and is recovering, you can start rehabilitation exercises to restore its motion, strength and balance. You can start off with sitting on a chair and moving your ankle up and down, followed by rolling your foot inward and outward. If these movements are bearable, proceed to stand with legs at hip width apart and lift up one foot at ankle level. Change to the other foot and repeat the reps. Slowly lift your feet off the ground on a tiptoe and hold the position before lowering it back down. Use a support if necessary. With a wall for support, lean forward with one leg bent and reach out for the wall with both hands at head level. The other leg should be kept straight and feeling the stretch along the calf. Do the same with the other leg. If you often suffer from sprains, you can lower the chances of such occurrences by wearing proper shoes or going through physiotherapy and stretching exercises to improve your balance and footwork. Other preventive measures can include ankle braces or sports tape which can hold and reinforce your ankle to prevent it from landing at susceptible angles. One of the most common causes of ankle sprains is weak ankle muscles. You can train your ankles to be stronger with a simple exercise. Wrap a towel around your foot to create some resistance and roll it inward as a simple movement. Do not attempt to do this if your ankle already hurts! What is Total Ankle Arthroplasty (Total Ankle Replacement)? Suffering from pain when you’re trying to move can lead to less movement on your part. When you’re trying to stay in shape, get in shape, or just keep mobile, pain can put a stop to all of those. Ankle pain can cause you to not want to leave your home or being reduce to having to have assistance when walking. Pain from arthritis can most times be tolerated but when it progresses it can leave you dealing with more pain than you can handle. How can you deal with this type of pain? How can you keep living life as you want to live it pain free and on your terms? There is a procedure called a total ankle arthroplasty that can offer some light at the end of your tunnel. Discover what this total ankle replacement is and who it might help. What is a Total Ankle Replacement? Total Ankle Arthroplasty, or commonly known as TAA, is a total replacement of the ankle joint area. This is used when there is significant arthritis in the joint due to age or sometimes a previous injury such as breaking the ankle. When you’re suffering from arthritis in the ankle, it can lead to deformation of the joint area, pain, and loss of cartilage. The procedure is performed by an orthopedic surgeon and the entire goal of this process is to allow you to walk and move your ankle with no pain and better movement. The surgeon will inform you on when it is best to have the procedure for your specific case. Not all cases are alike and some may benefit from this total ankle replacement while others may need to put the surgery off. There are some cases where TAA is not recommended such as those who have had infections in the joint area, neuropathy in the lower limbs, or in cases where dead bone is attached to the ankle area. These would not be good viable cases for the TAA as an option. After you have the total ankle replacement surgery, you’ll have a time where you do not need to put weight on the ankle. This will allow the ankle to completely heal and the joint to set in place as it should. You should use crutches to assist you in walking and keeping off the foot as much as you can. You’ll probably be placed in a type of cast or boot to help keep it stable and in place. Talk with your orthopedic surgeon to find out if you’re the perfect candidate for total ankle arthroplasty today and get back to living life on your terms. If you’ve ever had a sprained ankle you know just how painful they can be. Sometimes they can feel as if you’ve broken bones or torn ligaments but all you’ve done is twisted, or sprained, the ankle severely. Once your ankle sprain has finally healed, you may be susceptible to reinjuring the ankle if you do not take a few precautions. Here are four ways you can protect your ankle from reinjuring it after you’ve healed from the ankle sprain itself. If it’s only been a few weeks since you hurt your ankle, wearing a brace for a month or two while you’re exercising is a good idea. It will help to support the ankle during vigorous activity that might otherwise reinjure you. The semi-rigid type brace is best for right after you’ve injured yourself and you’re healed. It will offer the necessary support and protection during running, walking and other exercise. 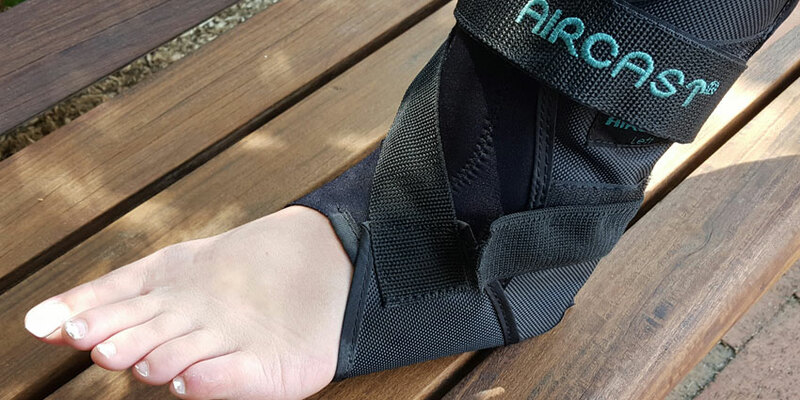 There are also other wraps and braces you can use to support your ankle during the time of gaining your strength back such as air filled or lace braces. Work on balancing on your foot that you injured. By practicing balancing exercises on that leg it helps to strengthen the leg and ankle to protect it from injury. Start out by only balancing on the leg for around 30 seconds or so. You can slowly increase this time as you gain more strength in the muscles. This should be done no less than three times a day and can be done more if you’re ankle is holding up to it. You should also perform heel raises to help strengthen the ankle. You can do these from a seated position or you can do them standing. Just as with the balance work, start by doing the heel raises and stretches for at least 30 seconds at a time and increase to three minutes or more as you gradually hold it longer. Other types of exercises you can use to help prevent an ankle sprain are toe raises, ankle circles and using steps to gain strength back in the ankle that was injured. You can also practice in and out motions where you turn your ankle as far in as you can and hold then turn it back out and hold. Adding in resistance to the in and out motion can also help you build strength back in the joint and ligaments. These are just a few ways to help you gain strength and protect yourself from having another sprained ankle. Another name for progressive flatfoot is Posterior Tibial Tendon Dysfunction. The posterior tibial tendon is found in the calf down to the inside of the ankle to the middle section of the foot. It is responsible for holding up the arch of the foot and gives us support when walking. Progressive flatfoot happens when the tendon becomes inflamed, stretched or torn, causing the arch to collapse. Not to be confused with plantar fasciitis, which is the inflammation of the plantar fascia, causing the bottom of the foot to hurt and swell. While progressive flatfoot is an injury to the tendon, plantar fasciitis is a strain to the ligament. Patients with progressive flatfoot will experience pain on the inner side of the ankle. The arch of the foot is now flat and pain gradually develops on the outer side of the ankle as well. Patients may be unable to or experience difficulty in supporting their weight on their toes. Progressive flatfoot is often caused by trauma to the ankle from sports or outdoor activities such as soccer, running and hiking. The posterior tibial tendon is overstretched, resulting in inflammation. This condition can also happen to patients with an abnormality of the tendon, usually women over the age of 50. Obese and diabetic patients are also at higher risk for this injury. Treatment is important to prevent chronic pain or even disability. If left unattended, the tendon would stiffen up and it might be difficult to walk or wear shoes. Arthritis would develop in the hind foot and the pain would spread to other parts of the ankle. If the condition is mild, patient would be wearing a cast or brace for 6-8 weeks to prevent the foot from weight bearing. At this point, anti-inflammatory drugs and plenty of rest are needed to recover. Patient would need to wear a shoe insert to support the arch after the cast is removed. For more severe cases or if the condition does not get better with non-surgical treatment, the doctor would recommend surgery. The surgical procedure may include cleaning away inflamed tissue, changing the alignment of the heel bone, repairing the damaged tendon, recreating the arch of the foot or joining two bones together to stabilize the hind foot. Our ankle joint is a complex structure involving bones, tendons and ligaments that helps to provide a wide range of motion including inversion, eversion, extension and flexion. These motions are responsible in providing stability and locomotion for the body. Our ankle bears the full weight of our body and any forces that are acting on it are of significance. Daily actions such as walking, running and jumping will have a huge impact. As a result, ankle pain is a common complaint experienced by many. What are some ways to reduce and relieve ankle pain? Flats are simple and comfortable shoes for all ladies out there. However, flats provide virtually no form of support for the ankle. People with ankle pain complaints suffer from pronation which is the inward rolling of the foot towards the arch. A pair of flats does not have anything to prevent pronation and does not help at all. In fact, it can worsen the situation. Although flats are comfortable, they provide no form of support for the foot. Instead, you should consider using gel inserts if you really need to wear your flats. Gel inserts provide a firm yet responsive cushioning for your foot and helps to prevent pronation. It also helps to absorb shocks and relieves stresses acting on the soft tissues. Flat surfaces are the best for our ankles. They allow proper heel striking by our foot and provide a firm surface to land on. However, we do not have the luxury of flat surfaces wherever we go. There are always uneven and bumpy surfaces which must be avoided when possible. These uneven surfaces increase the risk of injuries. During an ankle injury, blood from surrounding areas gushes towards the injured part. Using an ice pack can help to constrict these blood vessels and reduce swelling to a great extent. Always remember to place a piece of cloth over your skin before putting on the ice pack to prevent frost bite. Massages help to increase blood flow and circulation and are beneficial for patients with injured ankles. Due to the increased circulation of healthy and clean blood, growth repair cells are rapidly being transported to the injured region, aiding recovery. Ankle pain is a common complaint and it can cause a lot of discomfort and inconvenience. By following the 5 ways mentioned above, you can be sure of reducing and relieving ankle pain. Did you know that each person walks an average of 9000 steps per day? And the total distance covered by a person in his lifetime is sufficient to cover the Earth a whopping 4 times? Not only has the foot need to bear our body weight, it also has to lift it off the ground when we are walking. This places tremendous stresses on the ankles as well as the surrounding ligaments and tendons. With such a high use rate, problems can easily arise if it is not well taken care off. Imagine your ankle to be a car engine – you need preventive maintained after a certain mileage. However, you cannot give your ankle an off day as that will result in lots of inconvenience so the best alternative is to perform ankle strengthening exercises which can help to better support the ankle. Ankle strengthening exercises are simple and can be performed easily almost everywhere without the need for big and bulky equipments. The resistance band assisted flexion is a simple and convenient exercise that does not take up much space and time. You will need a resistance band which can be easily purchased from most sports shops. Place the resistance band over the top of your foot and curl the toes in. Slowly flex your leg outwards and you will be able to feel a slight pull at the ankle. Slowly return to the starting position and repeat for 3 sets of 20s. The Achilles tendon is the thickest and strongest tendon in our body and it passes through the ankle. Therefore, it makes sense to strengthen this tendon which is responsible for absorbing the weight of our body. Sit down in an upright position and using a towel, wrap it around the toes. Slowly pull the towel towards you and you should be able to feel a stretch in the ankle. Repeat this exercise for 3 sets of 20s. Toe raises can be performed almost anywhere, even when you are on your way to work or school. Stand on the edge of a flight of stairs and slowly raise your toe. Standing on the edge causes your body to shift the entire weight to the toes and help to strengthen your ankles. It can also help to promote a sense of balance in your body. Slowly return to the starting position and repeat for 20 times for 3 sets. Without such a high usage, it is not shocking to know that ankle injuries are common. However, the inconvenience and discomfort of ankle injuries are too serious to ignore. Simple ankle strengthening exercises are simple and convenient and a little can go a long way. Dancing is a physical activity that is accompanied with a certain level or risk. Dancing is something that needs to be gradually built up from scratch and one cannot simply jump into it expecting to do something they have never tried. Proper warm up and stretching as well as cooling down exercises will need to be performed religiously before and after every session. Injuries can be career threatening to any dancer and it is important to take precautions to prevent them from happening. Dancing requires a lot of jumping and knee twisting actions accompanied by sudden direction changes. This will place a lot of stresses on the knee, particularly the ligaments and meniscus. A tear in the knee meniscus is one of the most frequent injuries experienced by dancers and it can put you out of action for up to 6 months depending on the severity. It is important to strengthen the leg muscles particularly the knee, thigh and calf to help reduce the burden on the knee. A proper ankle connection is important in dancing. Ankle sprains occur when upon landing from a jump, the outside of the ankle rolls inwards due to a loss of balance. This will cause the ligaments in the ankle to tear. Ankle sprains are painful and will hinder you in many aspects of your daily life. You will be out of action for up to a month. Achilles tendonitis is tendonitis of the Achilles tendon and it occurs due to muscle overuse after repeatedly acting pressure on the calf muscle. It happens most frequently in dancers who place a lot of their weight on the lower body. Neck strain is a common injury and it happens so frequently because dancers have to move their head throughout a dance and many of them control it incorrectly. Instead of using the spine when they arch their neck, they use the tendons, overusing them. Dance practices and rehearsals can sometimes take a long time and start from early in the morning till late at night. As a result, they are easy victims to muscle cramps due to fatigue and a lack of required electrolytes to replace the ones they lost throughout the day. Sometimes it can happen due to improper warm up exercises. Dancing is a very physical demanding activity and the risk of injuries is high. New dancers will need to start slow while experienced dancers cannot be complacent and skip the basic warm up and cooling down exercises. Dancers will also need to ensure that they replace their lost fluid to prevent muscle cramps. Many people around the world participate in martial arts. There are 3 types of martial arts namely the light, medium and full contact martial arts and as the names suggest, each differs in the amount of body contact involved. Martial arts have many benefits to it, most prominently are the health benefits as well as the coordination between various parts of the body, body balance and flexibility. However, as with all kinds of full contact sports, there are injuries that are associated with it. Facial lacerations are the most common injuries sustained from full contact martial arts. They account for nearly 50% of all injuries in martial arts. Martial arts is all about predicting what your opponent will do next and if you fail to react accordingly, it can cause trauma to parts of your body, commonly the face. The result of a full blown kick to the face can cause facial laceration. During martial arts, tremendous stress is placed upon both of the knees and kicking is required throughout the whole session. As such, it can cause hypertension of the knee joint which will result to tendinitis. It can create strain to the back of the knees, patellar tendons and patella, causing pain and discomfort in players. Ankle sprains are also a common injury in martial arts due to the nature of uneven surfaces that the event take place. Most venues will place gym mattresses or other soft cushioning materials to absorb the impact of players. However, these soft and uneven surfaces can lead to improper weight distribution when kicking, causing sprains in the ankles. Kneecap dislocation is a serious injury that happens when the patella is shifted out of alignment with the knee. It is often caused by improper leg alignment or sudden kneeling motion, causing a sudden trauma to the knee. Whenever our feet is in use, the connective tissue or plantar fascia which supports the arch of our foot will tighten and stretch. However, it is prone to overuse if the incorrect footwear is worn. It is especially common in people with flat feet and who do not use the correct footwear with the correct support. Martial arts have a low risk of injury as compared to other full contact sports such as rugby. Most of the injuries that are suffered are often minor such as bruises. However, more serious injuries can happen either due to trauma or due to improper usage of protective equipment or total lack of them. Upon injury, for personal well-being, it is highly recommended to pursue professional diagnosis for the injury. It should be regardless of perceived severity as most injuries do not reveal the actual impact until years later or when there is severe pain. If the martial artist is serious about his practice, then all injuries should be treated at earliest time possible. Sports injuries are inevitable at some point in time of your life. After a hard training session or a game of your favourite sports, there will definitely be those post game aches and pain that you will suffer which are perfectly normal. In unwanted cases, you could have landed badly from a jump or fell awkwardly on your shoulders, resulting in a swollen ankle or shoulder. You try to self medicate but what injury is it exactly? Is it a sprain, muscle tear or a fracture? How do you differentiate them from one another? A sprain occurs when you stretch or partially tear the fibrous tissues or more commonly known as your ligaments. They occur mostly in places such as your ankles and wrists. Ligaments helps to connect the connective tissues from your bones to your joints. There are three degrees of sprains namely the first, second and third degree. Some signs of sprains include pain, bruising, tenderness, inflammation, swelling and immobility of the affected area. Sprains can usually heal on their own but more serious sprains may require surgery. Always see a doctor if the pain is excruciating or you suffer from numbness in the area which could imply something more serious. Muscle tear or commonly known as muscle strain implies that you have torn a muscle or a tissue called tendons. They occur most commonly in places such as the hamstring which is located at the back of you thigh. Muscle tear can cause severe pain and inability to walk or carry out normal functions properly. They are commonly caused by over use of muscles, suddenly pulling of the affected tissues and cyclic cycles of muscles. Fractures are probably the most serious as compared to tears and sprains. A fracture implies that there is a broken or cracked bone involved. Fractures are extremely serious injuries and you must seek a doctor immediately. Common symptoms include difficulty in breathing, loss of mobility at the affected area, fingers or toes turning blue due to lack of blood flow and seeing a bone sticking through the skin. There are two types of fractures namely the acute and stress fractures. Simple acute fractures are caused by a sudden hard blow to the bone resulting in the bone breaking, causing injury only to the bone and not to the surrounding tissues. If you see a bone sticking through your skin, you have a compound acute fracture which will cause infection to the surrounding tissues and are much more serious. Stress fractures are normally from repeated stress on your affected area mainly caused by sports or gymnastics. Now that you know what sports injury you are suffering from, you can do the necessary R.I.C.E actions and seek a doctor if you need to. There are so many different sports injuries and above are only three of them. Always consult a doctor if you are unsure as wrong self mediation can further aggravate the injury.